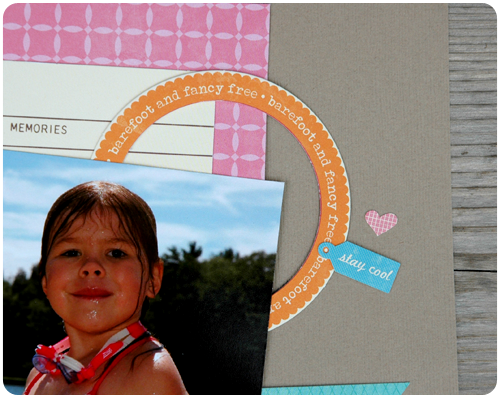 The Memory Nest (along with Little Bit of Scrap) issued a triple challenge this week: scrapbook a summer photo with a water theme and include an interactive element. Summer photos that featured water were easy enough to find - I think my girls pretty much lived in their swimsuits this summer - but the interactive element had me stumped for a bit. What to do? After looking through my pictures from one of our camping trips I decided to tuck a photo with some journalling in behind the main photos that I used for my page. The picture I hid away was of the view I saw as I sat on the beach and watched my girls enjoy their time at the lake. It is not a great photo, not one that I would normally choose to scrapbook, but it holds a special memory for me as it captures exactly what I saw and watched during our afternoon at the beach. I have not often included interactive elements on my pages, preferring to leave everything out in the open, but this challenge has certainly opened me up to the benefits of doing so. Hiding my 'view picture' away allowed me to include it on my layout, which I likely would not have done otherwise. 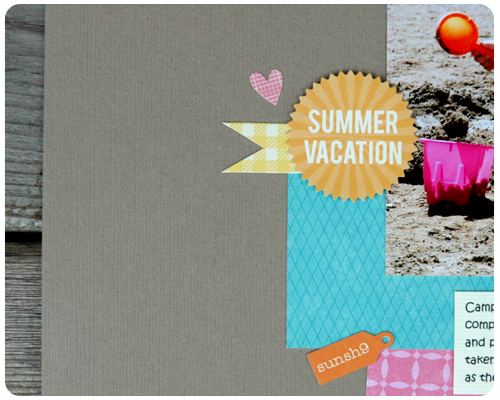 The paper and embellishments that I used for this page are from Jillibean Soup - Happy Camper and Watermelon Gazpacho Soup. Do you use interactive elements on your pages? If so, what are they? I am curious to know so please let me know in the comments. Visit The Memory Nest to see how the other ladies on the Design Team made their pages interactive. And feel free to take on this challenge yourself and then link up your creations. I love it ... such a beautiful layout.